The Rudy Bruner Award for Urban Excellence (RBA) has kicked off our site visits to the five finalist projects, located in Bethlehem (Pennsylvania), Boston, Chicago, Los Angeles, and New Orleans. We’re spending several days at each site, conducting research, and gathering additional information that we’ll present to the award’s selection committee in June, when they will determine the recipient of the Gold Medal and $50,000 cash prize. Our first stop was La Kretz Innovation Campus + Arts District Park (LKIC) in Los Angeles, a clean tech incubator and demonstration facility promoting the city’s green economy. Completed in 2016, the $49.2 million project is the product of an unusual public private collaboration between city agencies, the Los Angeles Department of Water and Power (LADWP)—the largest publicly owned utility in the country, and a consortium of local research institutions and businesses. Funding was provided by numerous public and private sources, including federal Community Development Block Grants and New Market Tax Credits, LADWP, and philanthropist Morton La Kretz. Located in the vibrant downtown Arts District within the city’s Clean Tech Corridor, the campus is part of a broader vision to promote innovation, technology, and a culture of sustainability while also encouraging reinvestment, job creation, and workforce development. Designed by John Friedman Alice Kimm Architects (architects of 2007 RBA Silver Medalist LA Design Center), the three-acre campus is intended to foster creativity and a sense of community among tenants and the surrounding neighborhood. The sustainable (LEED Platinum certification pending) development incorporates a 61,000-square-foot renovated warehouse and state-of-the-art technology, such as a surface parking lot with a 175-kilowatt photovoltaic solar canopy and fast-charging EV (electric vehicle) stations, a microgrid system, bio-swales, and the first public greywater filtration and recycling system in the city. The adjacent half-acre Arts District Park—the first public park in the neighborhood—is a green oasis created in partnership with the architects, community, and the Los Angeles Bureau of Engineering; it is used by campus workers and residents alike. 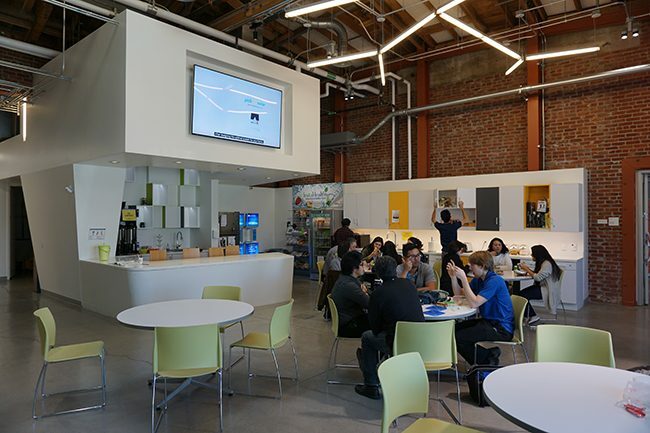 The building houses LA Cleantech Incubator (LACI), LADWP’s Sustainable Living and Customer Engagement Center, and an advanced prototyping lab. LACI, the anchor tenant, is a nonprofit business hub that provides flexible, affordable work spaces for clean tech companies, along with coaching and mentoring. It also provides them access to professional networks and sources of capital. Since its launch in 2011, LACI has nurtured and advanced 54 companies that, in turn, have raised $70 million in private investment and created more than 1,000 jobs. LADWP’s Customer Engagement Center features hands-on educational exhibits illustrating innovative, energy-saving products. The advanced prototyping center includes a 3-D printing and laser cutting shop. Electronics, robotics, and chemistry labs support the development of new technology by local businesses and offer workforce training. The project’s open and inviting warehouse interior incorporates the original building’s exposed brick walls and wood bowstring trusses along with new skylights, faceted walls and glass partitions, and artwork. 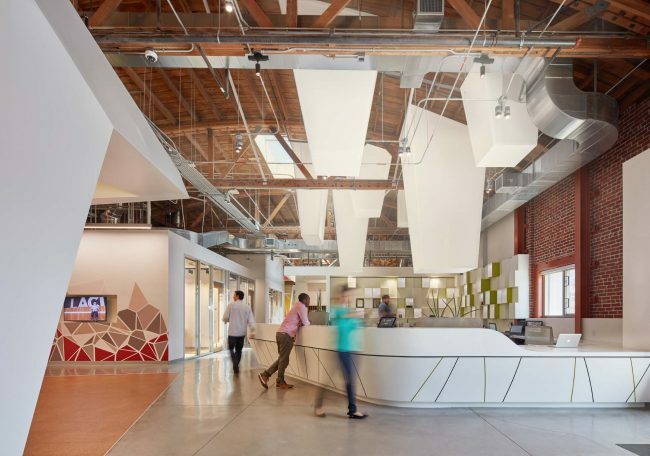 A network of interior streets connects workspaces, meeting rooms, and gathering areas, encouraging interaction and collaboration. LACI offers weekly educational tours of the campus and provides event spaces free of charge to the community. 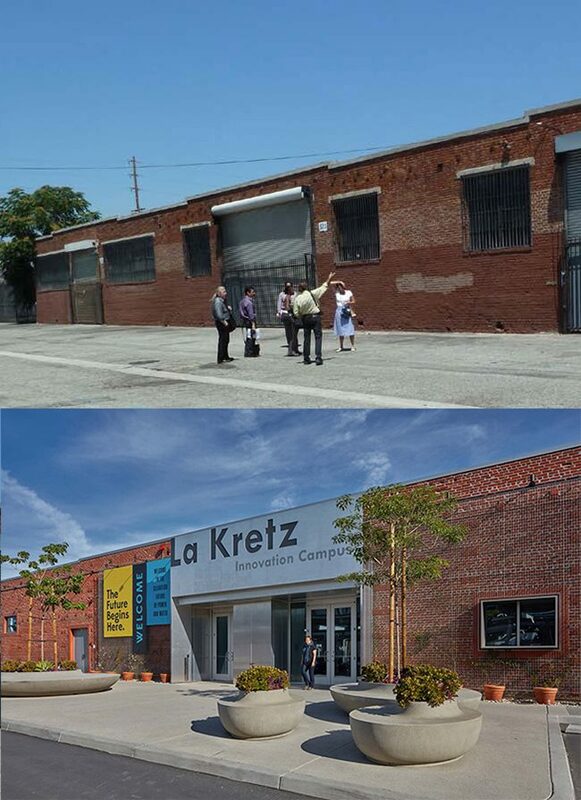 LKIC is one of several major public investments in the city’s Arts District area, including the new downtown regional connector subway and Little Tokyo/Arts District Station, the Los Angeles River Revitalization, and the Michael Maltzen-designed Sixth Street Bridge Viaduct Replacement Project. Together, they are redefining the identity of Los Angeles as a clean tech leader and sustainable urban center. Next, the RBA team heads to New Orleans to visit Iberville Offsite Rehabs I & II, 46 scattered site historic homes that have been rehabilitated for formerly homeless women and children. This post is part of a series written and curated by RBA that focuses on advancing conversation about placemaking in American cities and offers a detailed look at the 2017 award cycle and site visits. Celebrating its 30th anniversary this year, RBA is a biennial design award recognizing transformative places that contribute to the economic, environmental, and social vitality of the nation’s urban center.